Affiliate linksThe return of pumpkin spice latte also means it’s time to spice up your look! That means you can start rocking smoky eyes, berry lips, long lashes and flushed cheeks! Whether you’re looking to add a lust-worthy eyeshadow palette, dewy highlighter, or a rich wine-colored lip hue to your vanity, today I’ve rounded up my new favorite fall makeup must-haves that will have you covered for sweater-weather! Here are 10 of the most covetable fall 2015 makeup products to add to your shopping list! Urban Decay Naked Smoky – The latest addition to Urban Decay’s Naked compacts, this baby make sultry, come-hither eyes totally doable! Loaded with a dozen sultry, smoky neutrals, including warm bronzes, dimensional grays, rich browns, gorgeous taupes and deep black, Naked Smoky has you covered for endless smoky looks And it comes with detailed tutorials and an exclusive double-ended brush to make application easy. Sonia Kashuk Grand Bazaar Matte Lipstick – Luxury doesn’t have to come with a high price tag! Create a polished lip look for fall with these sophisticated shades of velvety matte color that moisturizes lips with wild mango butter. The two new shades include: Crushed Berry, a rich bordeaux and Crushed Petal, a pinky mauve – both perfectly on-trend for fall! Dedra Anti-Aging Tinted Moisturizer SPF 30 – This is the BEST tinted moisturizer I’ve ever tried! Not only is the coverage amazing but the oil-free formula is also nicely hydrating with a slightly dewy finish that looks very natural. Almost like a lightweight liquid foundation, it also offers broad spectrum SPF 30 protrection and contains potent antioxidants; vitamin A and E, extracts of pomegranate and white tea. It really does it all for your skin in one easy step…it’s worth every penny! Rimmel London Wonder’Lash Lift Me Up Mascara – Infused with cucumber extract and vitamins, the nourishing formula keeps your lashes conditioned throughout the day. Its precision brush with soft, lash-hugging fibres smoothly wraps each and every lash with defined, clump free volume…just perfect for hiding tell-tale signs of that late-night party! Lancôme Blush Subtil Palette – This all-in-one palette makes it easy to sculpt and enhance your best features in three simple steps: contour, blush, and highlight. 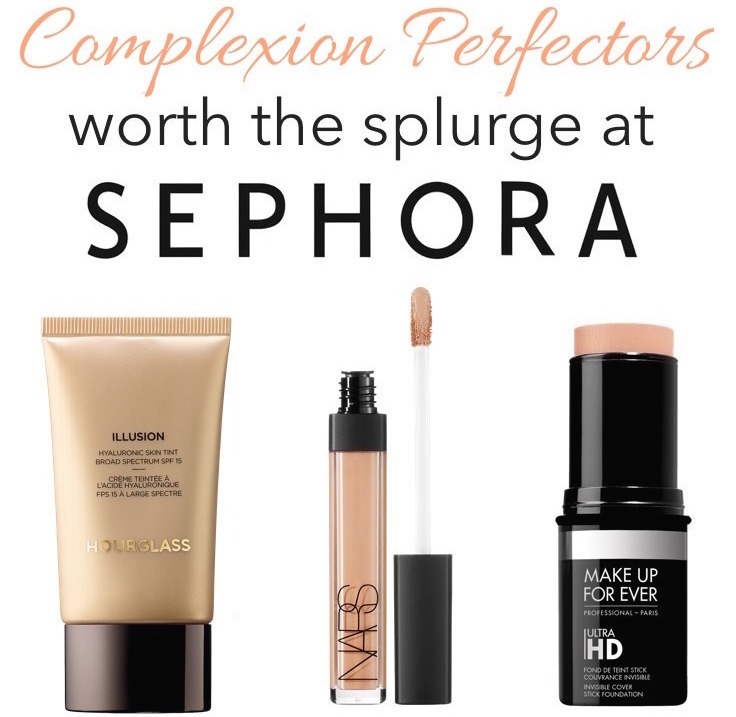 Its silky, creamy formula won’t settle into lines or pores and the coverage is buildable from sheer to intense. Clinique Skinny Stick – This new skinny eyeliner has an ultra-fine tip that fits closely into the lash line to create a natural-looking definition without the mess of a liquid liner. Perfect to create a soft wash of color for an easy, everyday-pretty look or tightlining, the rich formula glides on smoothly and there’s no sharpening required! The formula is allergy tested and 100% fragrance free. Palladio Butter Me Up Sheer Color Balm – This luscious, buttery lip balm moisturizes, protects, and smoothes lips with a super-soft conditioning formula. Available in 8 shades, it gives you a sheer wash of buildable color with a weightless feel. My favorite is Glaze, a pretty plum that’s perfect for fall! MAKE UP FOR EVER Ultra HD Invisible Cover Stick Foundation – Perfect for on-the-go foundation touch-ups and contouring, this multitasking cover stick provides medium-to-full coverage with a lightweight, second-skin texture for a flawless complexion. Another bonus is that it’s formulated with hyaluronic spheres for time-released hydration that’s much needed during the colder months ahead! L’Oréal Paris Colour Riche La Lacque Lip Pen – With irresistibly smooth & glossy pigment-rich color, this sleek, sophisticated pen glides on effortlessly in one precise stroke. Use it anywhere, anytime – no sharpener needed! bareMinerals bareSkin Complete Coverage Serum Concealer – This is a silky smooth, full coverage (yet lightweight) concealer and serum in one that instantly reduces the appearance of dark circles, discoloration, and other imperfections for a beautifully even-toned complexion. Plus, its hydrating humectants fight dryness and help nourish the undereye area. What are you most looking forward to stocking up on this season? Thanks for the beauty tips. I really want to get new makeup for fall. Will check out some of these products. The Debra sunscreen sounds like a wonderful product.